The Palisades Pack is Ruff Wear's top-of-the-line dog pack. 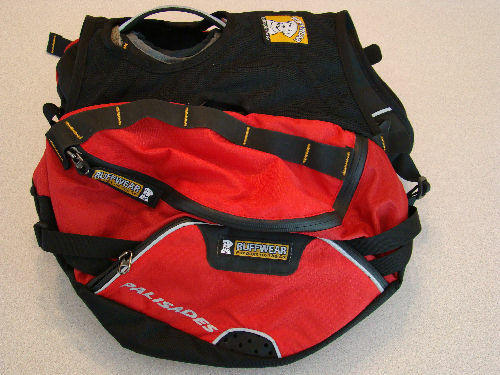 The Palisades pack attaches to the Web Master Harness, also from Ruff Wear, by way of 4 snap buckles. 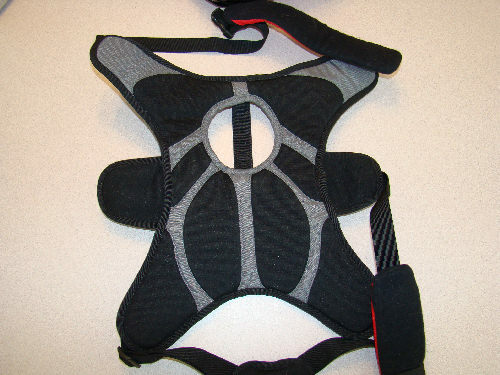 The harness can be worn by itself or with the pack attached. 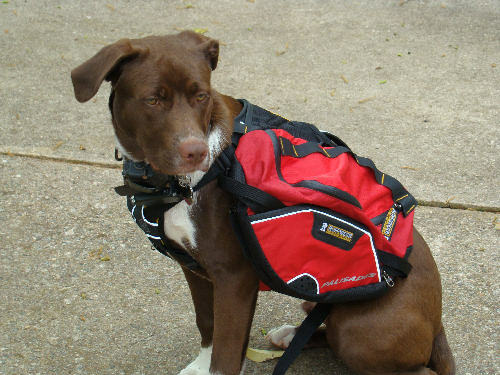 This allows the pack to be taken off while on breaks or just wearing it by itself while strolling around. 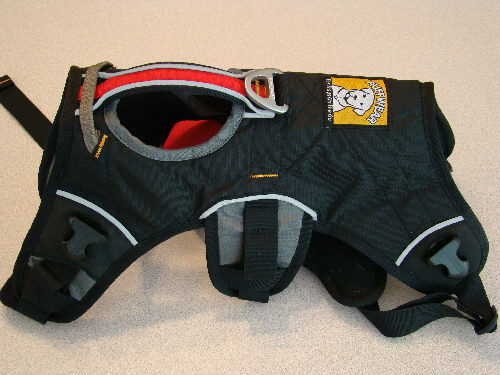 The harness has a 5 point adjustable fit system for a custom fit for the dog. The two straps that run under the chest and the belly are padded and adjustable. The underside of the harness is padded throughout and is made of mesh material for maximum breathability. 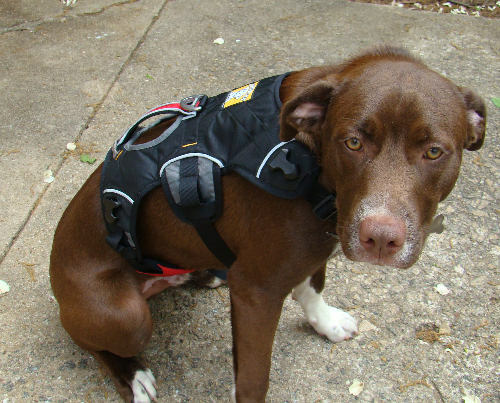 On top, the harness has a 'lift handle' to assist the dog over obstacles or streams. There is also an aluminum leash attachment and reflective trim around the edges of the harness for better visibility. The Palisades pack itself has plenty of capacity to carry all of the essentials that a dog my need while in the outdoors. The saddlebags are evenly distributed and has a watter bladder on each side. 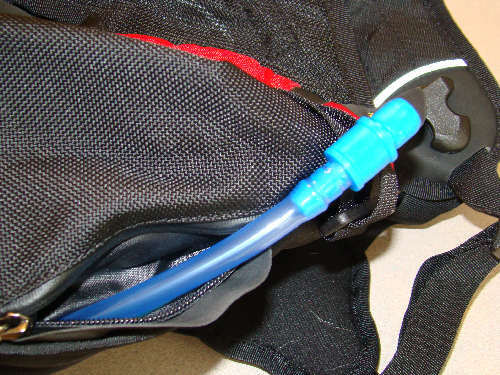 Inside the main compartment is a zipper to access the water bladder that can be removed. The smaller pocket on the front has cinch straps to draw the load of the pack to the harness for better weight distribution. The trim on the pack is also reflective and across the top on both sides is a daisy chain. 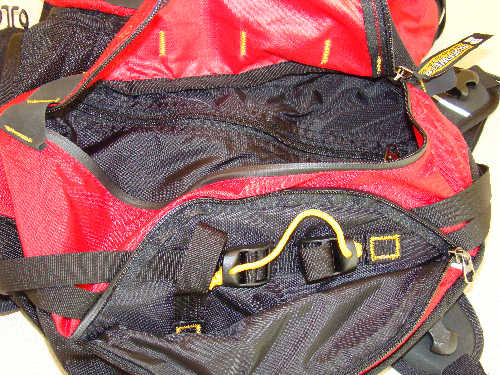 The main compartment zipper is a waterproof zipper but the front pocket is not. All zippers have very nice large zipper pulls for better grip. I was very pleased at the first look at the Palisade. It seems to be very durable and well rounded with pockets, bladder, handle, leash attachment, daisy chain and just about every feature that a human pack would have. The first 'try on' went well. I wasn't sure how Samson would take to having a pack on. He actually didn't mind it at all. I had to tighten the straps to almost the tightest position. But this will give him room to grow into it. Once I got the harness system set and fit right, the pack just snapped on with the four buckles. I pulled one of the bladders from the pocket and filled it up to see how Samson would take to drinking water from a tube. I filled the bladder up and to open the tube, the valve is twisted in a counterclockwise direction. Once I dribbled some water on his nose he knew it was good to drink it. It didn't come out as fast as I had thought it would but I guess most would be wasted if it did, it just trickled out. There seems to be plenty of room for trail essentials for him and I am excited about getting Samson out on the trail and seeing how he likes the Palisade. Unfortunately, I have not had Samson out on any long day hikes during this Field Report series with the Palisades. The temperatures here have been around 85 F to 100 F (30 C to 37 C) with about 90% to 95% humidity. I took him to a local park to do a 2 mile (3 k) loop and the temperature was 92 F (33 C) with 90% humidity and no wind. After gearing him up with the Palisades on his back and walking about 1/4 mile (.4 k), he laid down and panted for a while. I had the two included water bladders partially filled and was able to let him lap some water from the valve. After resting a bit we headed back to the car. I did not want to risk it any further until it cools off here. The harness was a little loose when I put it on him. He has a small waist and I have it cinched down as tight as it will go and there is still a little bit of room between the web strap and his body. He seemed to be able to carry the pack okay but again, we didn't go very far due to the heat. All that was in his pack was a few snacks and the water in the bladders. I hope to be more thorough with this testing in the coming months. Our fall season starts soon and it will be cooling off so I can take extended trips with Samson in the outdoors. The past month has cooled off some, at least enough for Samson and I to get in some time with the Palisades. Our first trip was to Table Rock where we did a quick out and back. The length was about 2.5 miles (4 k) on decent terrain with the temperature around 87 F (30 C). In Samson's pack was a few dog treats, an extra leash and some water in the bladders. He seemed to start out fine and when the wind shifted a certain way, he would stop and sniff towards the pack on the side of his treats. I thought to myself that this dog has a keen sense of smell but when I looked into the pouch, I realized that the pack was open. After closing the pouch we had a good, brisk hike up the mountain. We stopped a few times for a water break and he really seems to like the water from the tube. It was quick and easy and I didn't have to worry about carrying a separate water bowl or anything to hold the water. He didn't seem to mind the pack being on his back and he never appeared to be exhausted from the weight. We took another trip to Jones gap where we did a short 1.8 mile (2.9 k) loop that had two creek crossings. The temperature that day was a steamy 92 F (33 C) with about 90% humidity. I kept this one short because of the heat and made sure we hit the creek a few times to cool off. Again, he did not seem bothered by the pack being on his back. I cinched the underbelly straps a little tighter for this trip because of the creek crossing. He carried much of the same contents as the last trip but I also threw in a small hand towel for drying him off to keep the straps from rubbing his belly when they got wet. Even though the straps have a soft padded cover, they can still tend to irritate the skin when wet. We got to the creek crossing and he had a ball splashing through it. The water came up to his belly and it seemed to cool him off. The pack was never submerged under the water but it did get wet from splashing. The water seemed to just roll off the fabric and never penetrated into the pack to get the treats wet or the towel. After getting across I toweled Samson off and continued on up the trail. The second creek crossing was about ankle deep and he didn't seem to enjoy it as much as the first. All in all the Palisades pack is a great way for the K-9 to enjoy the outdoors as much as its owner. The pack and harness fit really well after a few adjustments at first. The straps never seemed to irritate the skin or be constrictive. The water bladders are a big plus and helps provide more room in the pack for other things besides a water bowl. Samson will continue to wear the Palisades pack even if we are just cruising through town or out in the outdoors. Thank you Ruff Wear and BackpackGearTest.org for this opportunity.